SA Trucking | Trucking and Transportation You Can Rely On. We’ve been handling imports and exports at the Terminals of New York, New Jersey, Philadelphia and Wilmington, Delaware for 20 years. Specializing in refrigerated cargo has given us the advantage of understanding the produce business. Our company-owned fleet provides intermodal transport for private carrier trailers in the Northeast, promising safe, secure delivery of your cargo to its final destination. Handling full trailer loads of dry and refrigerated trailers in the Mid-Atlantic States, we do single and multi-drop cargo. 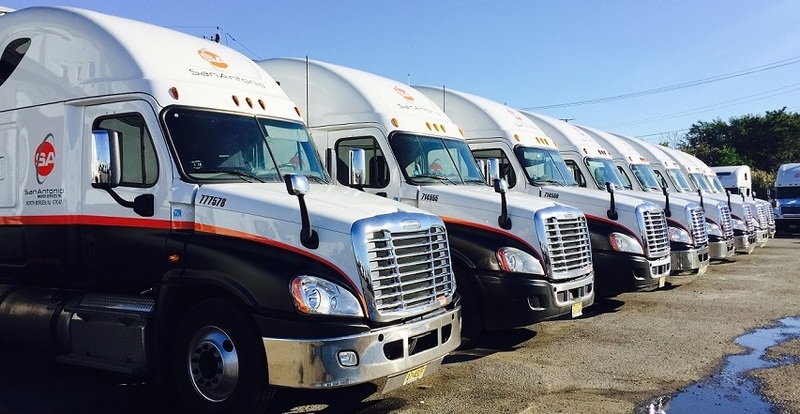 We now offer Cross Docking and Trans Loading Services at our North Jersey Facility. Handling Palletized and Floor Loaded Cargo. Backed by over 20 years of respected trucking, San Antonio Broker Services is reliable transportation. We’re a mid-sized company that aims for personal service. Our dedicated team of loyal drivers has one focus: getting your goods where they need to go—safely, and without hassle. Rely on us for your transportation needs and expect high-quality, personal, and reliable service in return.